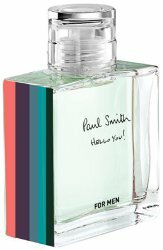 British fashion brand Paul Smith has launched Hello You!, a new fragrance for men. Hello You! is inspired by Paul Smith’s celebrated use of colour. The fresh, sparkling citrus opening is followed by a very British aromatic lavender heart, blended with a fruity apple accord. The base notes underline the strong masculinity of patchouli and vetiver, magnified with the sensuality of ciste absolute. Paul Smith Hello You! plays with traditional British themes with a light and irreverent touch. Hello You! was developed by perfumers Fanny Bal and Dominique Ropion. Additional notes include mandarin, bergamot, coriander and pink pepper. Paul Smith Hello You! is available at the Garden Pharmacy in the UK, in 50 ml Eau de Toilette. Hope it is good! It’s an unexpected name for a men’s fragrance.